PaZa Estate Winery opened almost 6-years ago for public tastings and sales. 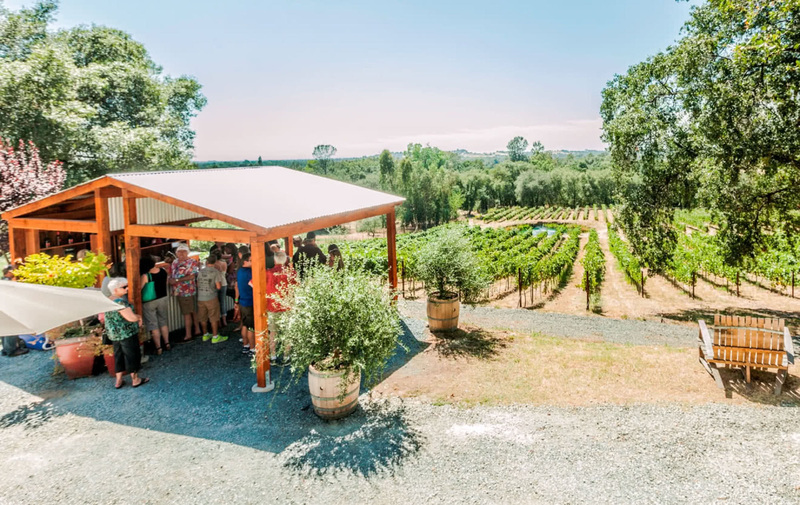 Their rustically elegant Tasting Shed is positioned near the vineyard, with awesome views of the Coastal Mountains and Sutter Buttes. It’s kind of like Napa was in the 70’s, where folks are welcome to bring their own picnic, relax, and enjoy one of the award winning wines. This wine story, like so many others, started from a dream. For Pamela and Zane, it began with friends almost 15-years ago. Touring and tasting wines in the Sierra Foothills, and meeting owners and wine makers of smaller boutique operations around Placer, El Dorado, and Amador. The couple found themselves fantasizing about living in the country, and owning a vineyard and winery. After looking at many properties in a short time, they found this slightly secluded place, surrounded by wonderful views, and potentially perfect spot for a vineyard. So, in 2005 they dove-in and made the move from Roseville to Auburn. Now, the vineyard is 10-years old, and just keeps getting better.